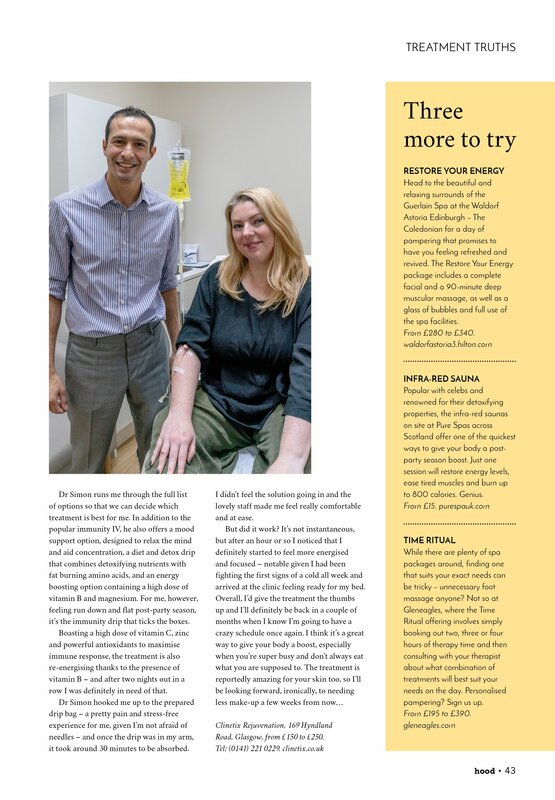 A few weeks ago Sara Hill from Hood Magazine visited Clinetix West End for a IV Vitamin Drip. Feeling run down and flat post party season Sara was looking for something to give her a boost. Earlier this year, I met my friend for lunch. He had just returned home after taking two major long-haul flights, to Sydney and LA, in the same week and, frankly, if that had been me, I’d have stood him up having stayed in bed with jetlag. Not him. Instead, he looked amazing – fresh-faced and energised. His secret? LA’s favourite treatment, the vitamin drip. Essentially an IV bag packed full of vitamins, minerals and essential nutrients, the vitamin drip is many a Hollywood A-lister’s go-to secret weapon. Celebrities such as Brad Pitt, Madonna, Rihanna and Simon Cowell are reportedly massive fans, with many making the treatment a part of their Oscars red carpet beauty ritual. “We also do drips to help improve athletic performance in training and in the run up to events. Our customers are professional singers (some pretty famous ones actually) who come for a series of drips before they go on tour, we have high-powered businessmen and women who just need that extra boost of energy and we have athletes who want a bit of help getting themselves to peak performance. Of course, we also have men and women who have just been partying to hard and need help getting back on their feet”. Dr Simon runs me through the full list of options so that we can decide which treatment is best for me. In addition to the popular immunity IV, he also offers a mood support option, designed to relax the mind and aid concentration, a diet and detox drip that combines detoxifying nutrients with fat burning amino acids, and an energy boosting option containing a high does of vitamin B and magnesium. For me, however, feeling run down and flat post-party season, it’s the immunity drip that ticks the boxes. 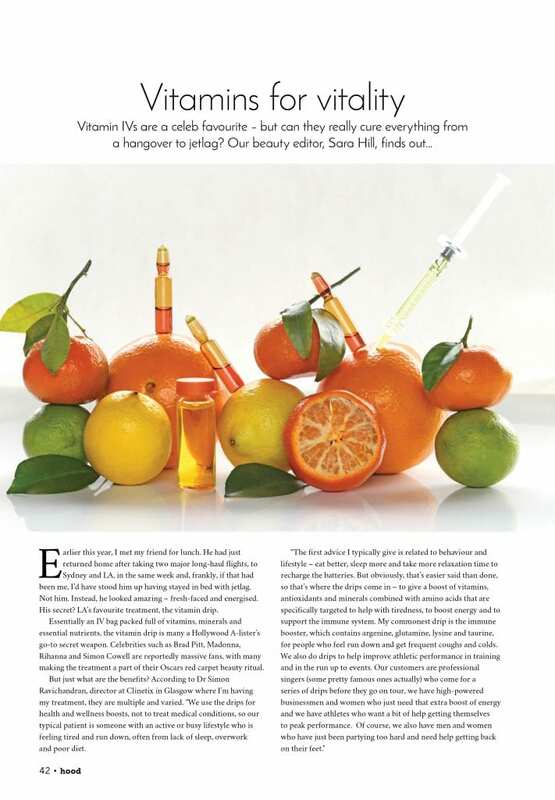 Boasting a high dose of vitamin C, zinc and powerful antioxidants to maximise immune response, the treatment is also re-energising thanks to the presence of vitamin B – and after two nights out in a row I was definitely in need of that. Dr Simon hooked me up to the prepared drip bag – a pretty pain and stress-free experience for me, given that I’m not afraid of needles – and once the drip was in my arm, it took around 30 minutes to be absorbed. I didn’t feel the solution going in and the lovely staff made me feel really comfortable and at ease. But did it work? It’s not instantaneous, but after an hour or so I noticed that I definitely started to feel more energised and focused – notable given I had been fighting the first signs of a cold all week and arrived at the clinic feeling ready for my bed. 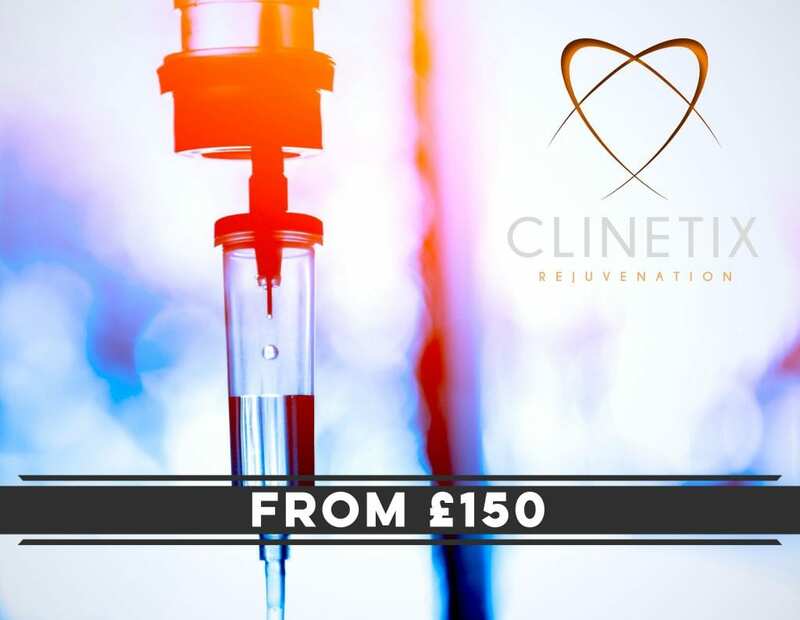 IV Vitamin Drips are carried out in both our multi-award winning clinics by Mr Simon Ravichandran MBChB.MRCS and RGN Sarah Gillies. To book a complimentary consultation where we can discuss your treatment concerns call the clinics on the numbers below.